Ultimate in Toronto is a serious sport. But ask many people about it and they won't take you seriously. "Ultimate Frisbee? That's not a real sport. Isn't that a game for dogs? Or stoned hippies in a park?" Few of such doubting Thomases know that the sport is simply called "ultimate", since the Wham-O toy company turned down the opportunity for the word "Frisbee", their registered trademark, to be used in the sport's name back in the 70s. In retrospect, probably not the wisest business move, now that most of the 5 million ultimate players around the globe play with standard 175-gram Discraft discs instead. Not trash can lids. Or dog toys from Old Navy. Even fewer also know that the recent book release Ninja Cowboy Bear was co-written by a Torontonian ultimate player, and inspired by an ultimate spirit game. Or that Rachel McAdams lists the sport as one of her favourite hobbies. Or that ultimate's inventor, Joel Silver, produced such high-profile films as Die Hard, V for Vendetta, and The Matrix series. Yes, ultimate is a real sport. It can be jaw-droppingly intense. And it's very, very much a part of Toronto. 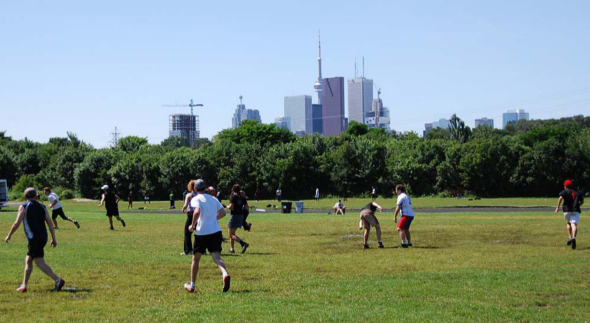 Ultimate is played year round (indoors when it's cold, unless you're rather intrepid), on over fifty fields across the city, from Downsview Park to Cherry Beach, Varsity Centre, BMO Field, and everywhere in between. I even spotted a handful of eager players tossing in the crowded Yonge-Dundas Square minutes before the Newmindspace Pillow Fight on March 21st, and couldn't help but join them. It turns out that one of them was also a member of the Toronto Ultimate Club, and another was a friend of an ultimate-playing friend. The ultimate community is special in that it's large enough for one to attend satisfyingly huge events (think 2-day, 31-team tournaments at Sunnybrook Park), but close-knit enough for those serendipitous connections to happen. If you know an ultimate player, chances are he or she knows someone who knows someone who knows you. Toronto's ultimate scene is a finer thread in the weave of the city fabric, epitomizing everything grassroots and counterculture. At the core of ultimate philosophy is Spirit of the Game (SOTG), an honour system that delineates ground rules for respectful play, places emphasis on the joy of the game, and compromises neither intensity nor sportsmanship. Ultimate is self-officiated, with players making and resolving their own calls. It's non-commercial (you'll never find a paid, "professional" ultimate player, even at the world championship level), cheap (all you need is a space and a disc), has co-ed and single-gender league formats, and spans all age ranges. Quite perfect, if you ask me. 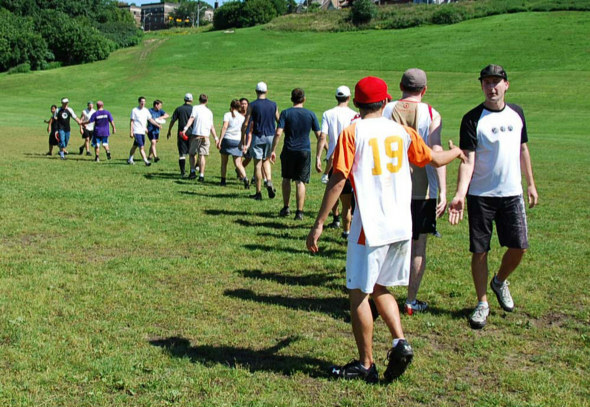 Currently the Toronto Ultimate Club (TUC), a non-profit and volunteer-driven organization, has over 3300 members, and many levels of play from recreational to international competitive leagues. This year marks the club's 30th anniversary. I've only been playing for two of those thirty, and it's incredible how important a part of my life Toronto ultimate has become. Everyone I've met has been supportive, and so darn nice. Not to mention fun-loving, and great partiers. Due to the nature of SOTG and the sport's culture, I guess you just find more passionate and community-focused people in the ultimate-playing crowd. We should be proud to have that element of altruism in our city, not to mention some kickass athleticism--Toronto is home to some of the best ultimate players in the world, and a slew of great up-and-comers. With a burgeoning population of junior players, and kids picking up discs as early as age 8, who knows what the future of ultimate will be? Abolish those misconceptions; it's a sport and it's not just something silly. Grab a friend, drop by a pickup game, and get your ultimate on, Toronto. It might change you. And okay, if you want...bring your dog. If you're completely new to the game, you might be interested in TUC's beginner/recreational skills clinic on April 25th. In the summer, pickup games are often held Sunday afternoons at Riverdale Park. Check the TUC forum to see if someone's called one together, or just drop by one Sunday and there might be one going on. 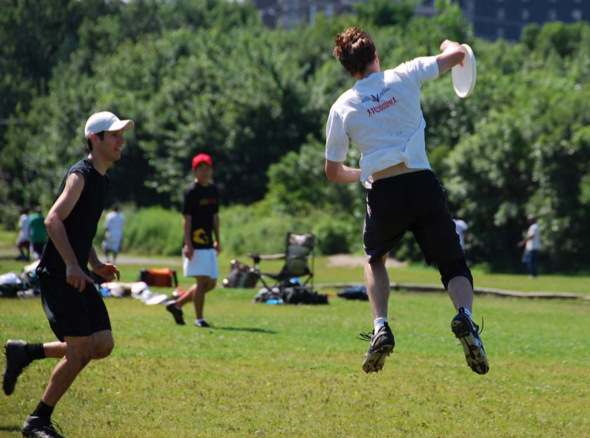 The Toronto Ultimate Club offers leagues year-round, on almost every day of the week, for all skill levels. Check out TUC's summer leagues, or their guidelines for finding a team to join. The forum is always a great place to start. If you know people under 18 who might want to get involved, there's also a great juniors program. The Toronto Sport and Social Club also offers co-ed and single-gender leagues five days of the week. A small warning though--from my experience, TSSC sometimes plays a modified version of the game, and they are a for-profit organization.